My husband and I decided to go to a circus themed murder mystery dinner this week. We are both avid fans of murder mysteries, despite the "cheese factor" of such events! I love Noir film and literature, so I suppose going to a murder mystery makes me feel like I am in the plot of a Raymond Chandler novel, if only for a second. This is especially true after a couple of martinis! The other thing I like about murder mystery dinners is the chance to dress up based on a particular theme. Last year we went to a 20's themed mystery, so naturally I dressed up as a flapper. Dressing for a circus theme doesn't offer as many possibilities in terms of what to wear. Should I be a clown? Maybe a tight rope walker? Both these didn't sound like very fashionable options. Instead I decided to dress up like a wild animal which might be found in a circus, in this case a zebra! I am normally not one to experiment with animal prints, however this dress was on sale recently at Kate Spade. It is the Kate Spade Jillian dress, one of my favorite styles offered by the designer. This particular dress retails for $438, but I was able to get it during the sale for $159 online. I thought for that price I could afford to experiment and take a risk with a print I am not accustomed to wearing. I am glad I took the risk! Even my husband, who loathes animal prints, thought the dress was "fetching." One thing I am known for is bringing a sweater wherever I go. You never know when it is going to get chilly, right? Sometimes it will be 90 degrees outside, but it is frigid inside the restaurant. I paired this dress with the J. Crew Jackie cardigan in sort of a turquoise/ Tiffany blue color. This creates one of my favorite color trifectas consisting of turquoise, redish-orange, and black and white. I guess technically that is four colors, not three, but who's counting! I chose satin accessories for this outfit. This particular Kate Spade Jillian dress is made out of linen, a more casual fabric. Despite this, you can really wear it for any occasion. I thought the satin would give it a bit more of a dressy, night time feel. Here is my go to Dolce and Gabbana satin clutch and Breguet watch. For shoes, I went with "Kate" again. 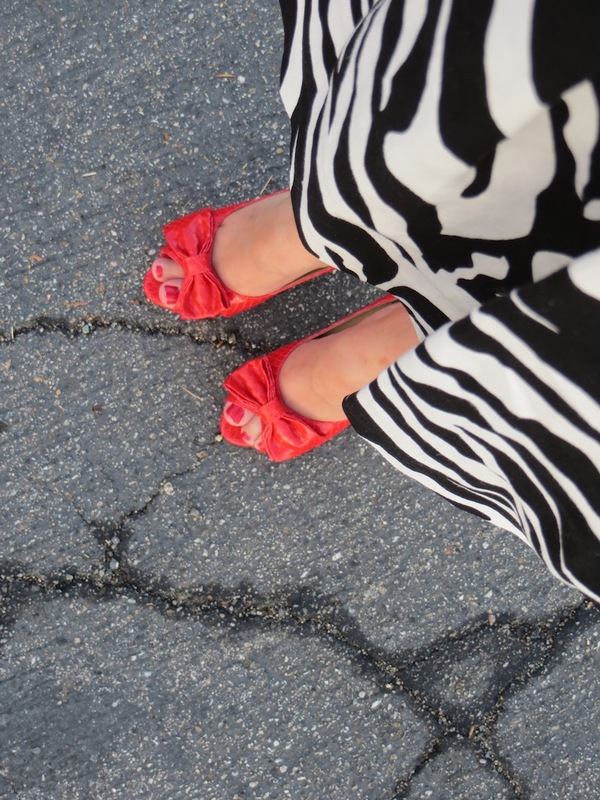 These are the Kate Spade "Susan" shoes in red snake print. I thought the snake print added to the wild theme I was striving for. I also like that these shoes have just a tint of orange in them. I am including a close up of the marquis of the restaurant that hosted the murder mystery dinner, the historic Sycamore Inn on Route 66. Where the inn now stands used to be a grove of sycamore trees located on the dusty Santa Fe Trail. You can still see the sycamores today and they are responsible for all the leaves you see in my pictures! Later on in the 1800's an adobe was built in its current location and used as a stagecoach inn. In 1920 a vintner and citrus rancher by the name of John Klusman constructed the building which now stands as the Sycamore Inn. Klusman intended the inn to be gathering spot for locals in the style of those found in his native Germany. In addition to housing a restaurant and hotel, the inn also functioned as a prohibition era speakeasy and brothel. A new owner, Danish immigrant Irl Hinrichsen, acquired the inn in 1939 and turned the Sycamore into a "hot spot" for locals and for those traveling to Las Vegas and Palm Springs. Numerous celebrities have dined and/or stayed at the inn and it is rumored that both Marilyn Monroe and Elizabeth Short (the Black Dahlia) visited shortly before their untimely deaths. I really like that zebra dress paired with the Tiffany blue color! I also love the red shoes. You look great in that outfit! Thank you Sandee! Your compliments mean a lot to me because I consider you to be the ultimate authority on all things Kate Spade!